Currently being refurbished, GRAHAM’s Coupland Building Project for the University of Manchester is a grade 2 listed building dating back to 1885. The original architect for the Coupland Building was the famous Alfred Waterhouse whose other Manchester landmark buildings includes the neo-classical Manchester Town Hall. As part of the refurbishment works GRAHAM Construction had to replace the existing timber windows with a “like for like” newer version of the originals in line with current building regulations. Identified in the early surveys of the building the main surviving architectural features were in the windows. 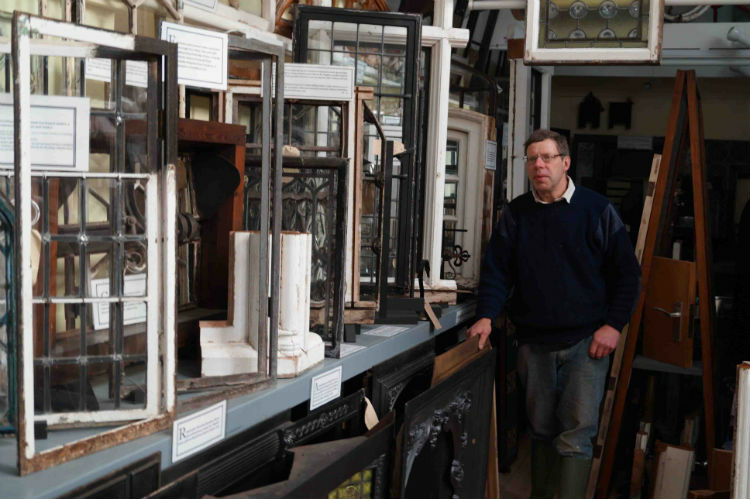 The site considered preserving the mullions and sash horns with the support of Architectural Conservationist Mr Charles Brooking who has been preserving architectural details from across the UK since 1966. Project Manager Andy Wertylo asked Charles if he was interested in having some of the Coupland Building elements in his extensive collection; Charles Brooking jumped at the chance and with his encyclopaedic knowledge of Waterhouse’s work knew the type of window detail to expect, he said that window sections from the Coupland Building would be “A valuable addition to his collection and would preserve the original architectural detail of a landmark Manchester Building”. Charles Brooking visited the building and managed the removal of selected pieces which once restored will be on permanent display in The Brooking Architectural Museum, and will be used to teach the future generations of Architects and Designers how Waterhouse designed his buildings to demonstrate their aesthetic grandeur. Redevelopment or demolition: Do you really need to demolish that site?